If the baby is low in the pelvis and moves well with pushing, a direct OP or face (mento-anterior only) delivery can be attempted. Ventouse must NOT be used for face presentations and is more likely to fail when used for a direct OP delivery. 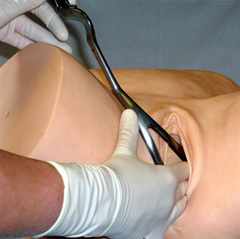 The forceps are applied in a conventional manner, being careful not to catch the face. As the head descends to hit the pelvic floor the direction of traction in an upward direction may need to be more exaggerated in order to flex the head. 3rd and 4th degree tears are more common with these deliveries (because the presenting part of the head has a larger circumference). Direct OP deliveries from mid-cavity (spines / +1) are less likely to be successful.